Math lovers around the world celebrate the mathematical constant 3.14159 with Pi Day on March 14. 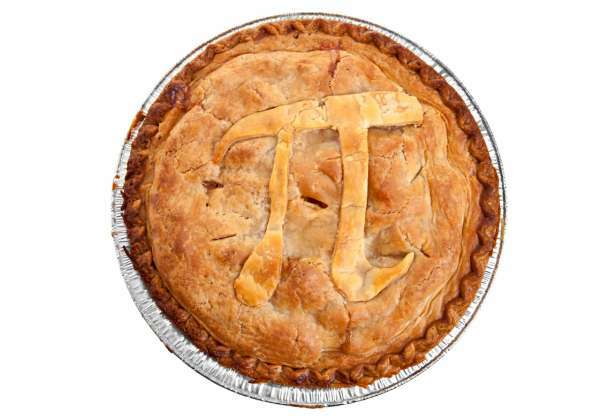 In honour of the revered symbol that represents the ratio of the circumference of a circle to its diameter, passionate math lovers compete in memorizing Pi’s digits, listening to Pi-themed rap songs, and even baking Pi-shaped pies. Pi, represented by the Greek letter p, has so far been calculated to more than one trillion digits beyond its decimal point. What makes it special is that the number will continue infinitely without repeating. Although only 39 digits past the decimal point are required to accurately calculate the spherical volume of anything in the universe, memorizing and calculating more and more digits is a fun challenge due to Pi’s infinite and pattern-less nature. To help celebrate the mathematical symbol, we’re sharing a delicious Pi day apple pie recipe you can bake (in a Pi shaped pan or not). Bonus is that apples are packed with both vitamin A and C, which help to treat night blindness. They also strengthen eyes and can help to prevent eyesight from worsening. Whisk flour and salt in a large bowl to blend. Add butter and shortening and rub in with fingertips until a very coarse meal forms. Sprinkle with 3 tablespoons water; toss until moist clumps form, adding more water by teaspoonful if mixture is dry. Gather dough into ball; divide in half. Flatten into disks. Wrap in plastic; chill at least 1 hour. Can be made 1 day ahead. Keep refrigerated. Soften slightly at room temperature before using. Preheat oven to 400°F. Spray 9-inch-diameter deep-dish glass pie dish with non-stick spray. Stir all apples, 3/4 cup sugar, lemon juice, 1/2 teaspoon cinnamon, and vanilla in a large bowl to blend. Let stand until juices form, about 15 minutes. Mix in flour. Roll out 1 dough disk on lightly floured surface to 12-inch round. Place dough in prepared pie dish. Spoon in filling; dot with butter. Roll out second dough disk to 13-inch round. Using a knife, carefully cut out the shape of the Pi symbol before draping over filling. Seal top and bottom crust edges together; trim to 1/2-inch overhang. Fold overhang under; crimp decoratively. Brush pie with milk. Combine remaining 1 tablespoon sugar and a large pinch of cinnamon in a small bowl; sprinkle over pie. Transfer pie to baking sheet; place in oven. Immediately reduce temperature to 375°F. Bake pie for about 2 hours or until crust is golden brown, apples are tender, and filling is bubbling thickly. Cover the edges with foil if browning too quickly. Cool 30 minutes. Serve warm or at room temperature. Cover loosely; store at room temperature. For more information on the intriguing calculation, visit the day’s official website. Sources: Dede Wilson, bon appétit; Mark McFerren, Digits of pi memorization contest; Pi Diddy of TeachPi.org, Lose Yourself in the Digits Pi Day rap; Pi Pie Pan, Amazon and Pi People.